1. Skylar Diggins, Sophomore, Notre Dame. Diggins is a complete player, with speed, vision and daring. Diggins is also charismatic, which is to say, there is charisma to her game, she has that elusive but electrifying star quality on the court. She runs point, but she's a shooting guard. She can hit from outside, but she go to the post. Heck, she's so good, even Lil Wayne is on the Diggins bandwagon. [82,168 Twitter followers as of this posting.] 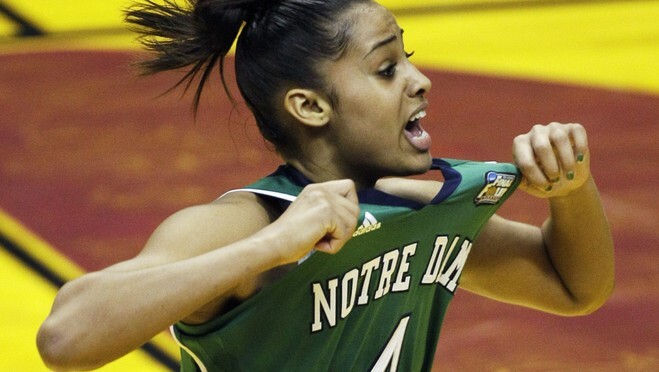 Diggins is perfect marriage of style and substance, and, playing at Notre Dame, she's on the perfect stage to perform. 2. Danielle Adams, Senior, Texas A&M. Adams was nothing short of spectacular in the title game, leading A&M to it's first basketball title, which also, by the way, was the first national championship in any sport for A&M since the 1939 football team. Adams got some miserable defensive assignments through the tournament -- to shut down Griner in the Elite 8, to shut down Ogwumike in the semi-final -- and she paid a physical price in doing so. Tuesday night, though, she stole the offensive spotlight, abandoned her outside shot (which is really pretty good), and took the ball to the hoop, over and over and over again. If the Sydneys (Colson and Carter) weren't feeding her the ball directly, she viewed any outside shot taken by her teammates as a pass, muscled up in the paint, pulled in the rebound and put in the put back. Adams' post performance was one for the ages. Also, it was cool to see four generations of women there, with Adam's mom, grandmother and great-grandmother in the stands. 3. Maya Moore, Senior, UConn. What can I say about Moore that I haven't already said? What can you write about one of the greatest players in college basketball history? Moore always struck me as mentally indomitable, that you might shut her down for a stretch, or a half, but she would find a way to gut out a win. When I think about watching Moore, this is the quality that comes to the fore, every time -- a completely driven player. No question, she has been the most dominant figure in the game for the last several years, the number one reason that the Huskies have been actually scary good at times. Whether it's a steal when her team needs a defensive stop or that beautiful little pull-up jumper, I am going to miss watching her play. 5. Courtney Vandersloot, Senior, Gonzaga. Is it just me, or should Vandersloot, the only college basketball player ever to score over 2,000 points and have 1,000 assists (men or women, she's the only one to ever have done that), be getting more national love? Yeah, yeah, I know she plays for the little Catholic school that could way out there in the pacific northwest, but, even given the locale and, even given the conference, Vandersloot is a marvel of vision and quickness. Always an assists machine, she learned to shoot more this year, and not just from the outside. (It didn't hurt that she was being mentored by none other than John Stockton.) In the 'Zags Sweet 16 game against Louisville, Vandersloot had seven assists which brought her total for the season to 358 -- an NCAA record, breaking the mark set by Penn State's Suzie McConnell (now Suzie McConnell-Serio) in 1986-87 of 355. 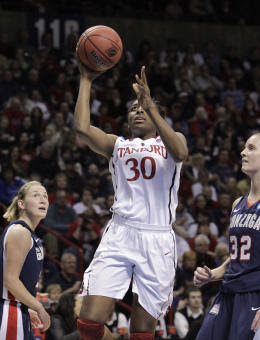 Vandersloot notched nine more assists in the 'Zags Elite 8 loss to Stanford, setting the single season record at 367, a record that may last as long as McConnell's did. 7. Natalie Novosel, Junior, ND. Diggins gets all the spotlight, Peters is a post-presence and a defensive cleaner, but Novosel's quite a player too. She's got a sweet shot and came up huge for the Irish, game in and game out. She played perhaps her best game of the tournament against UConn, when the Irish really did need all hands on deck, often running the point to free up Diggins. She plays shut down defense and can do so a little too enthusiastically sometimes, but I love the energy she brings the Irish on the floor. I am really looking forward to seeing the backcourt of Novosel and Diggins together for one more year. 8. Brittney Griner, Sophomore, Baylor. Demeanor-wise, she's more Angel McCoughtry than Danielle Adams or Tina Charles, which is to say, you don't get a warm fuzzy watching Griner play. But I'm going to take a second to defend Griner here. 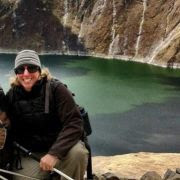 She has been attacked, sometimes viciously so, and not just by anonymous internet commenters (i.e. cowards), or bloggers, but even by some members of the mainstream media. You can see where a person might get pissed off after years of that kind of talk. At the very least, you can understand why Griner might be reticent to open up in interviews and why she might be emotionally guarded, even on the basketball court. As to her game, she has so many gifts and I think she's still growing into basketball self. She's got great length, is a shot-blocking tour-de-force, plays in the paint with the ball high and goes right to the basket. The kid put up 40 points in the Sweet 16. Forty! In Kim Mulkey, I think she's found the perfect coach to guide her through some rough waters. 9. 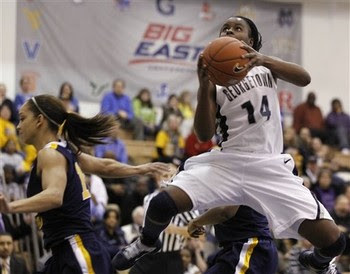 Sugar Rodgers, Sophomore, Georgetown. Another Big East guard who is lightning fast, pushes tempo, and will dribble-drive. The Hoyas stormed passed Maryland and into the Sweet Sixteen behind Rodgers' 34 points and 9 boards. For those who don't follow the Big East, this was Rodgers' coming out party. And now, time for my shameless beg to the programmers at ESPN: As ND and G'Town are Big East teams, and as that means they will play each other at least once next year, please, please, please broadcast the ND-G'Town game next year. For the love of all that's right and holy, I want to see Diggins v. Rogers. 10. Kayla Tetschlag, Senior, Wisconsin-Green Bay. I really went back and forth on this last spot. A&M's Sydney Colson? ND's Becca Bruszewski for gutting out the tournament on a gamey leg? Tennessee's Shekinna Stricklen? Griner's teammate Melissa Jones? But I think that if any mid-major is going to really break through, I wonder if it might not be the Phoenix? Up until their Sweet 16 loss to Baylor, W-GB was riding a 25 game win streak, largely thanks to Tetschlag. Even in that loss to Baylor, Tetschlag played all 40 minutes and put up a double-double (27 pts and 10 reb.) It makes me wish I had seen her more throughout her career. For Vandersloot, Adams, Moore and Tetschlag, so long, thanks for all the memories. For the returning players -- Diggins and White, Ogwumike and Rogers, Griner and Novosel -- I'm expecting great things from you next year.